Welcome back guys. In this new video we're going to handle a new topic, that's important but a little bit annoying, the whole idea of polyatomic ions. Now, we're going to say that polyatomic ions are compounds that are made up of different elements, usually only nonmetals, there are exceptions to this and we'll see them when we go through the list. So, usually polyatomic ions are made up of only nonmetals and they possess a charge so that charge could be positive or it could be negative. Now, let's take a look at each one of these. So, for the first category we have singly charged positive ions, we're going to say that a positive ion is also known as a cation and we're going to say for the most part there's only one that you're responsible in knowing and that's NH4 plus 1 ammonium. So, it's the only polyatomic ion that has a plus 1 charge. Now, the second one, the second cation that you're going to be responsible for has a plus 2 charge, it's called mercury 1 ion. Now, you might wonder why is it called mercury 1 since it has a +2 charge wouldn't be called mercury 2? Well, what you need to realize is this +2 charge is coming from the combining of 2 Mercury's together, we're going to say we have 1 +1 mercury combining with the second +1 mercury and together their charges +2, that's what we call it mercury 1, because it's a +2 charge coming from 2 Mercury's. Now, those are the only positive polyatomic ions you're responsible for, now we move into the negative ions, we're going to say that negative ions are called anions and the first chart we're going to look at singly charged anions, so the first one, the most common one is acetate. Now, just realize that acetate can be drawn in two ways, it can be drawn as CH3 CO2 minus 1 or C2H3O2 negative, you're responsible for knowing both ways acetate can be written because your teachers will go from one to the other anyway they want. So, just be aware of the both forms that acetate exists in. Now, the next one is going to be our cyanide ion and then we have our hydroxide ion and here's our first exception, we say that polyatomic ions are usually only nonmetals but in permanganate, we finally see that we have a metal involved the Mn is manganese, manganese is a transition metal. Now this is an exception to the polyatomic ions because again it has a metal for the first time, most polyatomic only have nonmetals but there are a few that you're going to have to know that possess metals, this being one of the first. Now, you might next notice that I put nitrate and nitrite in bold and what we should realize is what's the difference between the two in name, we're going to say that this has an -ate at the end but this has an -ite at the end, how do we go from -ate to -ite, what we have to realize is this has to do with the number of oxygens present in the compound, we're going to say that nitrate is NO3 minus 1 to go to -ite all you have to do is just remove an oxygen. So, if nitrate is NO3 minus 1, nitrite is NO2 minus 1. So, basically, if you know one you know the other, if you know what nitrate looks like then you know what nitrite looks like because it all has to do with removing an oxygen. Now, for the next one, we're going to skip these and come back to them, let's move up to our doubly charged anions these guys have minus 2 charges. Now, you might also realize here that we have exceptions again in both of these, we have CR, CR is chromium and chromium is a metal. So, that's another exception. Remember, for the most part a majority of polyatomic ions only have nonmetals but they're going to be sometimes when we're going to see metals involved. Now, you might notice next that we have sulfate and sulfite, same exact pattern we have to remember from the last time, how do we go from -ate to -ite removing oxygen. So, if sulfate is SO4 2- then sulfite, just remove an oxygen its SO3 2-, the charge stays the same, it's just the number of oxygens that are changing, next we're going to move to our Triply charged anions, again they're both in bold, we have -ate, we have -ite. So, if phosphate is PO4 3-, remove an oxygen that gives us phosphite, charge does not change, only thing that's changing is the number of oxygens. Now, let's go back to here, we have our doubly and our singly charged anions and we're going to say that this right here is called hydrogen phosphate, from the name we can know what the compound looks like, we're going to say if you have a polyatomic ion and hydrogen is in the name, we're going to say hydrogen exists in Group 1a, group 1a ions are plus 1, so this is plus 1. So, we have a hydrogen plus 1 combining with a phosphate, we just saw that phosphate is PO4 3-. So, all you have to realize here is that we have this plus 1 combining with this minus 3. So, if you work that out with basic math that gives us a negative 2. So, that's where our compound is HPO4 2-, it's the positive one that's reacting with the negative 3 and the phosphate that gives us this negative 2 charge. Now, for the next one, we have dihydrogen phosphate. So, then you have two H pluses still reacting with phosphate. Now, we have 2 hydrogen's, each one is +1. So, overall that's plus 2. So, we have a plus 2 and a minus 3 reacting and because there's two hydrogen's we put a 2 there to signify that there's two of them and then we have PO4 minus 1, hydrogen carbonate can also be called bicarbonate. So, remember both names and how do we create this, we just have an H+ combined with carbonate, which is CO3 2-, that plus 1 from the hydrogen will combine with the negative 2 from the carbonate, negative 2 plus 1 gives us a negative 1 charge and then finally the last one hydrogen sulfate or bisulfate. So again, that's just H+ with sulfate, which is SO4 2-, again the plus 1 and a minus 2 combined to give us a minus 1 charge overall at the end. Now, these 4 compounds might seem a little weird but just remember, as long as you can remember what the sulfate carbonate and phosphate look like you should be able to name them and draw them correctly. So, basically you have to remember the ones above to be able to do those last 4 that we covered, I know the polyatomic list might look really challenging, it's a lot of information, I get that, but just remember, separate things into different categories, who are our cations who are anions, from there break it down into the charges, okay? Which cations are +1, which ones are +2, for my anions who is minus 1, minus 2, minus 3, and then remember, the trick that we learned about nitrate and nitrite, about sulfate and sulfite, about phosphate and phosphite, knowing that already eliminates six of the polyatomic ions you're responsible for then the rest you just have to sit down, look at it, see the patterns in order to remember the names, a lot of things connect together so the more and more you look at it the easier it'll be for you to understand and memorize the information given to you. So, good luck with learning all the pattern that we talked about. Polyatomic Ions are compounds composed of different elements. All polyatomic ions have a positive or negative charge. Remember the halogens are the elements in Group 7A. We're going to say that polyatomic ions that contain halogens are sometimes referred to as oxy halogens or halogen oxyanions. When we say oxy we mean that oxygen is present, so we're going to say that these polyatomic ions are going to have halogens and oxygen. And remember, when we say anions all we mean is a negative ion, so a negatively charged ion is called an anion. Now we're going to say these compounds share four common characteristics. First thing, they contain one halogen. And remember, when we say halogen we mean Group 7A, so fluorine, chlorine, bromine or iodine. We don't worry ourselves with the last element in Group 7A, At, we're just focused on these four. Next characteristic that they share is they contain one to four oxygens. So all these compounds are going to have halogens and they're going to have one to four oxygens.Next thing, they contain no other elements. And then finally, they possess a negative one charge. So that's the four characteristics all of these compounds in this video are going to possess. Now we're going to say that these compounds use the same system for naming and it's all based on the number of oxygens that are present. What we're going to say first is, for each non-metal, each non-metal has a base name. So fluorine is fluor-, chlorine is chlor-, bromine is brom-, and iodine is iod-, so those are the base names. Those base names are going to be positioned in each of these blanks here. That's what goes in each one of these blanks, the base name. Now we're going to say based on the numbers of oxygens present, that's going to determine the name of our polyatomic ion. So we're going to say when we have one oxygen present the prefix will be hypo, the beginning of the name will be hypo-. The beginning of the name will be hypo-. Based on the halogen present, it could have any one of these four base names. The ending, the suffix, will be -ite. So remember the prefix, which is the beginning of the name, will be hypo- and the suffix, which is the end of the name, will be -ite. Now if we possess two oxygens, we drop the prefix hypo- but we keep the suffix -ite, and depending on which halogen you have you plug-in that base name. When we finally move on to three oxygens, the -ite that we have changes to -ate. And then finally when we get to four oxygens, we get a whole new prefix per-. We'll still we use one of these base names depending on which halogen is present, and then the ending will stay -ate. So just remember this pattern and you'll be able to answer any of these questions. The naming system for polyatomic ions with halogens is based on the number of oxygens present. Polyatomic ions that contain only oxygen and fluorine are imaginary and do not exist. 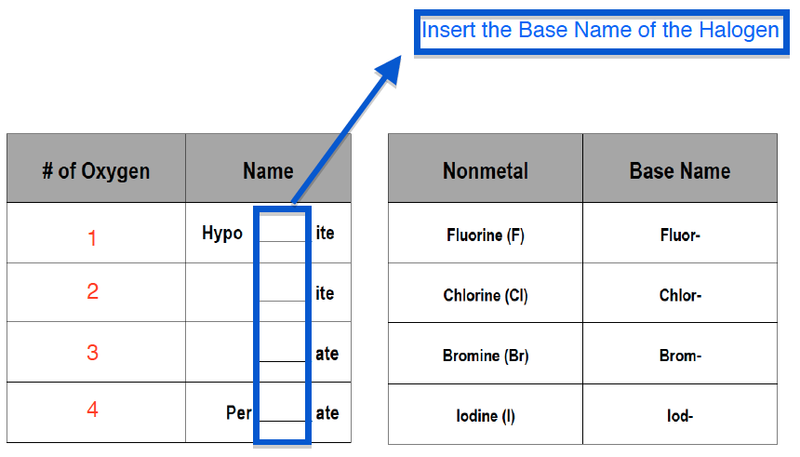 However, in terms of naming we can still use the rules we learn to name these imaginary polyatomic ions. Practice: Name each of the following compounds. Polyatomic ions are compounds made up of different elements, usually only NONMETALS, and possess a CHARGE. The ion NO2– is named A) nitrogen dioxide ion. B) nitrogen(II) oxide ion. C) nitrite ion. D) nitrate ion. Polyatomic ions are compounds made up of different elements that possess a CHARGE. Recall that metals possessing multiple charges are referred to as Type II Metals. Below we have the formal or IUPAC name of some of the most common Type II metals as well as their older latin derived name. Breaking News: At 11 am this morning NASA announced that they have evidence liquid water still flows on Mars. Water can stay liquid at such low temperature because of the high concentration of salt dissolved in the water, and some scientists believe perchlorate ions play a major role. Write a formula for the perchlorate ion. What information is conveyed by the endings -ide, -ate, and -ite in the name of an anion? Elements in the same group of the periodic table often form oxyanions with the same general formula. The anions are also named in a similar fashion. Based on these observations, suggest a chemical formula or name, as appropriate, for each of the following ions.hydrogen tellurate ion. Elements in the same family often form oxyanions of the same general formula. The anions are named in a similar fashion. What are the names of the oxyanions of selenium and tellurium:SeO42–, SeO32–, TeO42–, TeO32–? Knowing the names of similar chlorine oxyanions and acids, deduce the names of the following: IO-, IO2-, IO3-, IO4-, HIO, HIO2, HIO3, HIO4. What is the formula for the carbonate ion? What is the formula for the chlorate ion? What is the name for SO42-? The ____________ ion.